in the North Carolina Department of Archives and History. In the three years following Governor Samuel Stephens' death, Albemarle's factional problems had persisted. Peter Carteret, who in December 1664 had been named by the Lords Proprietors to the post of Assistant Governor of Albemarle County, was named Acting Governor by the Executive Council on 10 March 1670 to succeed Stephens. He was Governor until May of 1672. Click Here to read the Lords Proprietors' Instructions to Governor Peter Carteret. The Executive Council's action was permitted by Stephens' instructions from the Lords Proprietors. 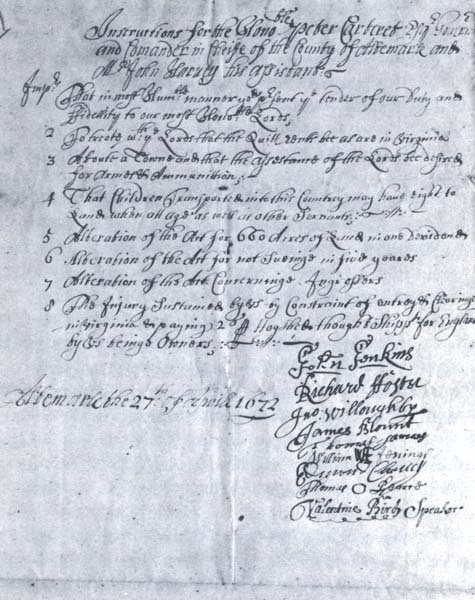 The governor and Executive Council in a May of 1671 letter to the Lords Proprietors objected to the new rules of the Fundamental Constitutions relating to laying out land in squares of 10,000 acres, increased quit-rents, rules against engrossers of lands, and the inability of those representatives chosen by the people to make proposals in the Assembly. They also mentioned continuing disorders in the county. Several years of major setbacks in agricultural production, included major August hurricanes in 1667, 1669, and 1670, and three months of drought, followed by a full month of rain in August of 1668, had caused considerable difficulty for the agrarian economy of the colony. The combination of the agricultural difficulties and the disagreeable new rules imposed by the Fundamental Constitutions led, in April of 1672, to the Executive Council instructing Governor Peter Carteret and John Harvey to go to London and present the colony's case to the Lords Proprietors. At least seven of the nine members of the Executive Council who took that action were later to be involved on the same side as John Culpeper in the 1677 disturbances. Governor Carteret was praised by the Executive Council for "more unity & tranquility than ever before," but those are comparative terms indicating that not all the controversy had been resolved. On the departure of Governor Carteret "the government was organized as the Lords Proprietors had directed and he was complying with the Lords Proprietors' instructions, although he was protesting against those instructions." John Harvey travelled only to New York with Governor Carteret before "more then Ordinaire accident & Ocassion of busisynes necesitated to returne." In December of 1671, Thomas Eastchurch wrote from Virginia to Governor Carteret to complain about "some mens madness" and several persons pretending that he was in debt to them so that they could attack and otherwise spoil his estate. He confirmed receipt of letters to Governor Carteret from the Lords Proprietors via a Mr. Robert Holden and stated that in the same delivery he had also received his own appointment as Surveyor General for Albemarle County. Prior to his departure for England, Governor Carteret appointed "Leftenant Collonell John Jenkins" to be his Deputy to act for him with full authority until his return or other directions from the Lords Proprietors. Jenkins was one of a group of relatively longtime residents who were given land grants on 25 September 1663 by Sir William Berkeley. Others of that group included John Harvey and William Jennings, both members of the Executive Council in 1672. Governor Carteret's failure to return to Albemarle County, whether because of knowledge of the negotiations with Sir William Berkeley or for other reasons. such as a possible appointment of Thomas Eastchurch as governor, is not known, but no available documentation of guidance from London for about four years exists. Carteret's commission of the Lords Proprietors issued in October 1670 expired in October 1674, under the terms of the Fundamental Constitutions. Thus the legal basis for the government ended at that time. John Jenkins was still serving as Acting Governor as late as 12 March 1674/75 and probably as late as 26 July 1675, when he took depositions for the trial of Thomas Miller for blasphemeous utterances. Young Peter Carteret was a distant kinsman (fourth cousin) of one of the Lords Proprietors, Sir George Carteret, and his brother Philip was to serve as Governor of New Jersey from 1665 to 1682. Appointed Assistant Governor and Secretary of Albemarle County in December of 1664, Peter Carteret landed in the colony on February 23, 1665. Carteret's life followed more closely that of a farmer than that of the traditional picture of an executive. Indeed, his years in Albemarle County illustrate rather graphically the lives of the early Carolina settlers. In addition to his governmental duties, he was charged with the operation of the plantation on Colleton Island, which in 1665 consisted of little more than some cleared land, "a 20 foot dwelling howse [and] a 10 foot hogg howse." For the next seven years the Assistant Governor then Governor of Albemarle County grubbed in the soil, at times approaching dangerously near to starvation. After two years, prospects had been bright, the crop yield was promising, although Carteret's new eighty-foot "hogg howse" could not prevent at least one-third of his swine from dying. The plagues of Albemarle County rivaled those visited upon ancient Egypt. On August 27, 1667, a hurricane ripped through the colony just at harvest time. The following year the burning, bright sun of a drought crisped the crops until July 30. Then nature, in one of her more capricious moments, opened her heavens to soak the parched earth with rain until the last of August, thereby doing more damage than had the long dry spell. Misery compounded itself when on August 2, 1669, in the midst of the tobacco harvest, another violent hurricane brought ruin. And just four days more than a year later, on August 6, 1670, the winds rose to new heights as still another hurricane levelled crops and houses. Even the whale oil industry, which Carteret had been developing with some success, fell off, for in 1669 the mammals no longer came in close to the shore. Such was the situation when Governor Samuel Stephens died. Carteret could have entertained little happiness when the Executive Council, on March 10, 1670, confirmed him as governor of an area where "it hath pleased God of his providence to Inflict Such a Generall calamitie upon the inhabitans of these countreys that for Severall yeares they have Nott Injoyed the fruitts of their Labours." Albemarle County had reached the bitter edge of poverty and famine. The Virginians were of little help; instead they took advantage of the situation and raised corn prices. Early in Governor Peter Carteret's administration came the first word of the Fundamental Constitutions of Carolina, which, declared the Lords Proprietors, "Shall be unalterable." The flame was fanned, as murmurings crept among the people that within this new frame of government lay the germs for a self-erected aristocracy, with the general population reduced to little more than the level of feudal serfs. An additional cause for apprehension lay in the information that a new colony was to be seated in the southern part of Carolina, and destined to become the primary center of government. This alone was enough to give rise to the fear that soon Albemarle County would revert to its former status of isolation. And, the Lords Proprietors went on, the colony "will never be in a happy & safe posture" until towns were established. The Fundamental Constitutions of Carolina, however, with its systems of courts and councils, could never become workable until a nobility was created. And although the people were assured they were to have a voice in the government, as required in the Charter, the Lords Proprietors maintained a check on their legislative programs through the appointment of Deputies to represent them on the Executive Council. And it was the Executive Council, not the Assembly made up of representatives of the people, who retained the right to propose, or initiate, all legislation. The Great Deed of Grant of 1668, despite its surface appearance as a liberal concession, proved rather empty in application. Rents upon some occasions were raised back to their old level of one-half penny an acre. The news of the Fundamental Constitutions, framed within a medieval structure, seemed only to confirm the persistent rumors that quit-rents were to be eventually raised to as high as six pence per acre. Discontent was so evident in early 1672 that the Executive Council felt it necessary that Governor Peter Carteret and his Assistant, John Harvey, travel to England to lay their grievances before the Lords Proprietors. Heading the lists of complaints contained in a letter dripping with words of respectful submission, was the request that quit-rents be again lowered until they were consistent with those of Virginia. And the laying out of land in 10,000 acre plots as outlined in the Fundamental Constitutions the Executive Council considered to be both impracticable and a deterrent to future settlement. Moreover, they feared it would encourage contempt for the law. There were proposals that the Lords Proprietors furnish some aid in the establishment of the towns they had urged so strongly. And, it was added, it would aid considerably if the Lords Proprietors would furnish arms and ammunition to the settlers. Included in this petition were suggestions concerning the property rights of children who had arrived in the colony as indentured servants, as well as several other changes to be made in the present conditions of land tenure. Somewhat apologetic about the straightforward manner in which they presented their grievances, the Executive Council explained they felt this approach to be "more Christianlicke than by fawninge & disemblinge pretences." They included a warning against "the Juglinge devices & Stratagemes" of those in Virginia who were attempting to bring Albemarle County within the jurisdiction of that colony and who were already discriminating against Carolina tobacco being shipped through Virginia ports. The unrest in Albemarle County was indicated in the warning that there were factions within who were undermining the confidence of the people "by making mole hills mountaines of Discouradgments." The Executive Council explained that Governor Peter Carteret, "by whose prudence and Integrity God hath blessed us since receiving that charge," was being dispatched to London, accompanied by John Harvey, for this personal representation would be almost "as if wee had had ye conveneince & happiness to have Spoken Man by Man to your Lordshipps." Before his departure Governor Carteret issued to John Jenkins, President of the Executive Council and Lieutenant-Colonel of the Albemarle County militia, a commission endowing him with all of the power of governor. By early June the two agents of Albemarle County were in New York awaiting passage to England. But on July 11, 1672, John Harvey, pressed by "more than Ordinaire accident & Occasion of busisynes," found it necessary to return home, leaving Governor Carteret to shoulder alone the burden of presenting the Executive Council's grievances before the Lords Proprietors. Governor Carteret entertained the hope that he would eventually return to Albemarle County as the colony's Secretary, but he never did. Much has been made of Peter Colleton's statement that Carteret had fled Carolina, "having left ye Government there in ill order & worse hands." This unwarranted accusation seems to have been an attempt by the Lords Proprietors to justify their own neglect and shortcomings in the development of Albemarle County and to brand Carteret as the goat for all of the later troubles and unrest in Albemarle County. Unless the Executive Council was masking its own sentiments in weasel words, their address to the Lords Proprietors spoke of "ye goodness of our Governor." In addition, they implied that it was Governor Carteret's "prudence" and "Integrity" that had given Albemarle County "more unity & tranquility than ever before." In Governor Carteret's defense, it should likewise be remembered that in addition to his executive position, he was charged with the responsibility of making a financial success of Colleton Island. Similarly, he was under constant pressure not only to develop the whaling industry, but to promote the more exotic and profitable products of sugar, silk, and vineyards. Nevertheless, the Albemarle County of Governor Peter Carteret was a simmering cauldron of unhappy people, dissatisfied with their present and apprehensive of their future. In such a situation the seeds of discontent and rebellion can always find fertile soil. Click Here for what little is known about the Executive Council under Governor Peter Carteret.